We embarked bright and early yesterday morning for the APS April Meeting in St. Louis, after a hair-raising few hours of wondering if we would be stranded at LAX along with several thousand other disgruntled travelers who made the mistake of booking flights with American Airlines. I lucked out: AA's reservation people managed to rebook me on another flight, and I arrived in St. Louis on time, bag in hand, with nothing worse than a splitting headache (a common occurrence when I travel). Others have not been so fortunate. And while the airline's harried staffers get kudos for managing the mess as best they can, I have this to say to the corporate bosses about their lame attempts to put a positive "spin" on the situation: When you are forced to ground over 1000 flights all across the country because you haven't been adhering to FAA's maintenance regulations, thereby stranding tens of thousands of passengers, this is not an "inconvenience." It is a major meltdown of a major sector of US transportation, a situation more typical of former Soviet Union countries during the Cold War, and a worrying indication that the long-struggling US airline industry is on the brink of collapse. Perhaps the airlines could take a page from the US space exploration enterprise. Yeah, I know NASA's been struggling with budget cuts and various other matters, but gosh darn it, they can certainly build robust machines. (Granted, most of these are unmanned. The on-board instrumentation isn't constantly demanding in-flight entertainment, free drinks and nibbles, and more leg room, or trying to shove oversized bags and baby strollers into already-crammed overhead compartments.) The Hubble Space Telescope is still sending back jaw-dropping images from the edges of the visible universe. Mars Rover had a few glitches, but its little probes have rolled across the Red Planet's surface far longer than their originally estimated lifetimes. And Cassini, currently orbiting Saturn, has given us some of the best images of that distant planet we've yet collected. Cassini might be nearing the end of its mission, but that's as much to do with budget cuts as anything else. Scientists hope to extend its lifetime another two years, pending funding approval from Congress. (Jen-Luc Piquant murmurs a semi-cynical, "Bonne chance.") 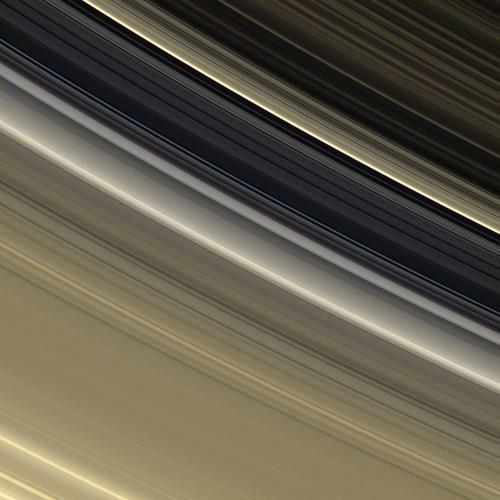 Turns out that Saturn and its famous rings are far more complex, from a physics standpoint, than most of us realize. At least, that's the impression I got from Joe Burns of Cornell University, who gave a blackboard lunch talk at KITP on Monday -- the perfect preparation to the upcoming APS meeting, which focuses quite a bit on cosmology, astrophysics, and particle physics research. Scientists have been fascinated by Saturn's rings ever since Galileo Galilei trained a rudimentary telescope on the planet in 1610 and noticed their blurry outlines. The instrument's resolution wasn't quite sufficient for Galileo to make out what those blurry bits actually were, but by 1655, the technology had improved to the point where Christian Huygens could accurately describe them as a disk surrounding the planet. Ever-better telescopes provided ever-better views of Saturn's rings in the ensuing centuries, but eventually we had to go see for ourselves. Voyagers 1 and 2 sent back loads of images in 1980 and 1981, and as is often the case in science, the images raised as many questions as they answered. Sure, the rings are pretty and all, and make Saturn immediately recognizable even to the youngest school children. But there's some really fascinating physics going on, according to Burns, and that physics isn't entirely understood. Here's what we do know: The rings are made of lots of small particles that range in size from microns (very tiny) to meters, with the bulk falling in the range of the size of seashells to the size of surfboards, as Burns colorfully described them. Those particles have clumped together as they orbit Saturn, "innumerable small objects orbiting a dominant central mass." They're made of water ice, mostly, with bits of dust and other chemicals creeping in from time to time. What don't we know? Well, for one thing, scientists aren't sure how old the rings are; Saturn's rings guard that secret as zealously as any aging star in Hollywood. The rings could be a mere 100 million years old, given the relative brightness and purity of the "water ice" that make up the ring particles. Incoming meteoric dust should have darkened the rings substantially by now. They might be ancient, dating back to when the planet first formed. Maybe the particles are the remnants of an old moon broken apart by a collision. (We have resisted the obvious joke: "That's no moon, it's a [fill in the blank]!") Those pieces in turn collided with each other, losing energy in the collisions while still conserving angular momentum, with the end result that the systems flattened out into the thin disks we now see around Saturn. The most likely circumstances for such an initial "trigger collision" (an old moon with another celestial object) existed during a period known as the Late Heavy Bombardment (would Wikipedia lie to me?) some four billion years ago. But even so, if collisional physics were the sole mechanism for the ring formation, there would be more diffusion, i.e., the edges would be blurry. They're not: they're sharply delineated, although they do show evidence of "sinusoidal scalloping" along the edges: waves that kind of "flow" along the rim. Also, there are areas where the ring's texture "becomes ropy in places and strawlike elsewhere," indicating that the simple angular momentum model is insufficient to explain all the rings' features. "So new physics is going on," said Burns. There are three main rings, rather unimaginatively dubbed A, B and C (at least it's easy to remember), by far the densest of the rings with larger particles. There are also several fainter rings (Dusty Rings) that have been discovered in recent years. The D ring is faintest, and closest to the planet itself. Just outside the A ring, one finds the narrow F ring, and beyond that are two very faint rings known as G and E. For a very long time, astronomers thought that the ring system's radial resolution was 100 meters -- impressive enough, given the size of the planet, but even more impressive now, when scientists have revised that number based on new evidence. The radial resolution is actually just ten meters thick. "That's like taking a piece of tissue paper and spreading it across the entire [UCSB] campus," Burns said. While we tend to think of Saturn's disk as a series of little ringlets, according to Burns (and also per the aforementioned Wikipedia), there are very few true "gaps" in the disk. The best known gap is the Cassini Division that separates rings A and B, and has its own Huygens Gap near its inner edge; the inner C Ring contains the Colombo Gap, while the outer C Ring contains the Maxwell Gap; and within the A Ring we have the Encke and Keeler Gaps. Those gaps aren't always empty, either: both the Encke Gap and the narrower Keeler Gap contain embedded moons, for instance. In 2006, Cassini images revealed evidence of four tiny "moonlets" in the A ring, roughly 100 meters in diameter, too small to be directly observed. But they produce propeller-shaped disturbances that span several kilometers. Scientists now believe the A ring could contain thousands of similar objects; 250 "propeller" moonlets have been detected to date. Why do things like these gaps occur? Perhaps the spreading outward is interrupted by destabilizing orbital resonances -- essentially gravitational relationships -- that arise when the local orbital period of a particle corresponds in a simple ratio to the orbital period of a nearby satellite (a moon or moonlet). For instance, the G ring is basically a faint, rubble-filled arc that orbits Saturn seven times for every six orbits of Mimas, one of Saturn's moons. So that would be, say, a 7:6 ratio orbital resonance. Per Burns: "Adjacent to such resonant locations, a moon's gravity systematically perturbs a ring's mass distribution, thereby initiating spiral density or bending waves, which transfer angular momentum between the moons and the rings and ultimately drive them apart." Such a process (a kind of "shepherding mechanism," in Burns words) would serve to "truncate rings and pry open gaps." Should Cassini identify changes in any moon's motion, this hypothesis could be verified. Scientists are interested in studying all these features of Saturn's rings in greater detail because the processes at work are analogous to other systems, including protoplanetary disks (the nurseries where nascent planets are born), our own asteroid belt, the formation of spiral galaxies (such as the whirlpool galaxy), and even the accretion disks around black holes. It's not the exact same processes at work, but there are striking similarities, so the expectation is that studying Saturn's rings can teach us about the mysterious underlying physics of some of these other celestial objects, as well as the origins of our own solar system. How do hordes of orbiting bodies crowd together? How does material accumulate in such systems to form moons or planets? And how do nearby masses disturb -- and are in turn perturbed by -- adjacent disks? Should Cassini's mission win its two-year extension, it's likely we will make some intriguing inroads into answering those questions. While I agree that the AA situation was not handled well and NASA has done an amazing job putting up some of the most incredible hardware, I would not want airplanes to have the same success rate as the Space Shuttle. This is one of those places where a 98% success rate is not good enough. Thanks for all the cool posts. I've enjoyed reading your site.